The launch of the Alliance for Fair Food coincided with the national release of "Food Chains," which was a smash hit at the box office and in the streets as it premiered in cities across the country these last two weeks. With sold out screenings from Tampa to New York to San Francisco, thousands took in the big screen story of resistance and transformative change, spilling from the theaters and heading straight to the doorsteps of Fair Food holdouts Publix and Wendy’s. No movie premiere would be complete without a run in the Big Apple, and Food Chains certainly did not disappoint. New Yorkers filled screening after screening in two different theaters. 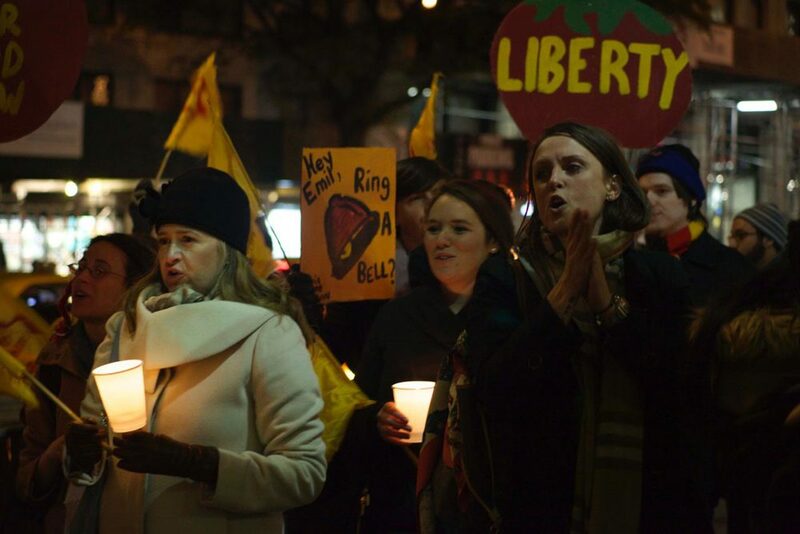 Moved by the CIW’s story of determination and hope, moviegoers took to the streets for a weekend of Wendy’s actions, braving the subzero chill to hold a candle-light vigil and flooding the streets with a boisterous, 200-person march down Broadway. In Miami, students from Barry University, St. Thomas, University of Miami, Miami Dade College and Florida International University joined local clergy, packing a standing-room only theater. 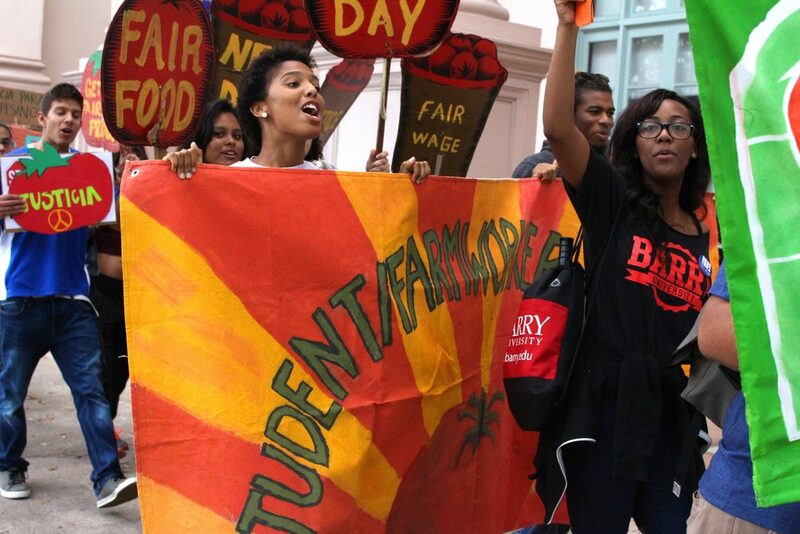 Following the screening, over 200 students electrified the streets in Miami’s Coral Gables neighborhood, leading a march down Miracle Mile to Publix alongside members of the CIW. Even the grocery store’s manager was moved to action and committed to “watching Food Chains in the near future." 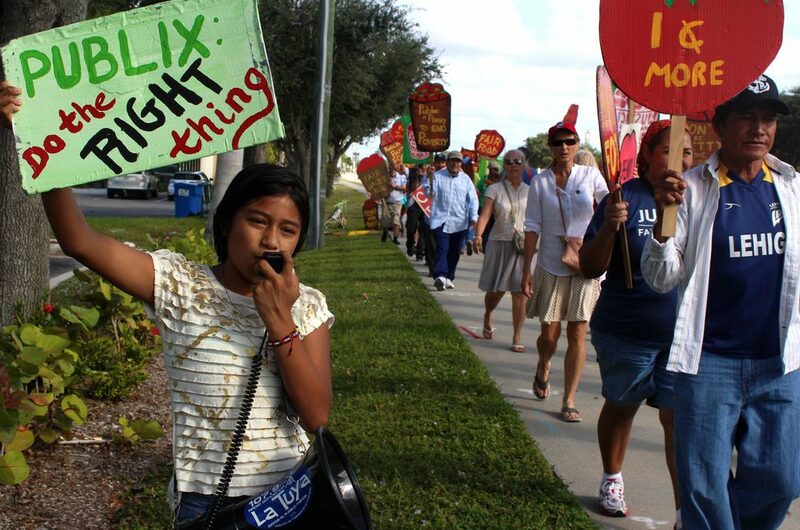 Down in Southwest Florida, some of the CIW’s longtime allies welcomed farmworkers and the film to Bonita Springs. A standing ovation thundered within the theater following the screening on opening night as CIW member Lucas Benitez took up the microphone. The following day, SW Florida supporters joined the CIW’s Women's Group to pay Publix a visit, demanding the grocer end its entrenched resistance to the new day for farmworkers dawning in its backyard. Central Florida’s I-4 corridor was out in full force, filling theaters in Tampa and Orlando to see "Food Chains" on opening weekend. 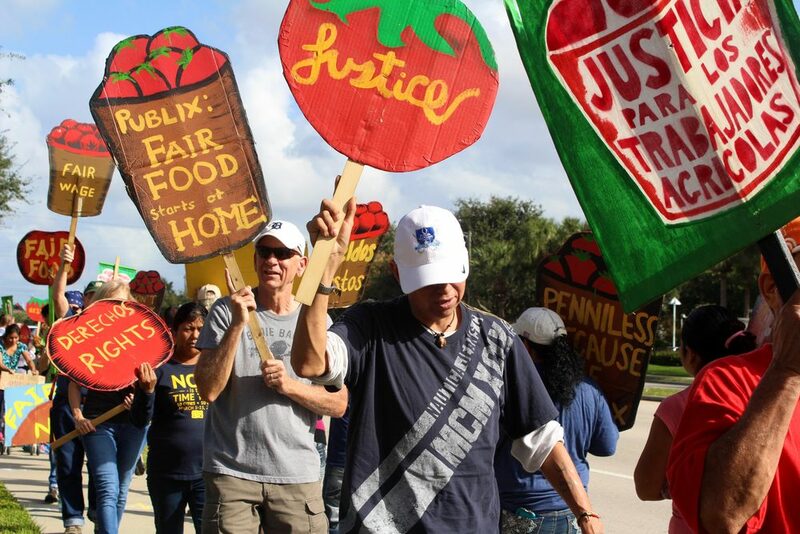 Five years into the Publix campaign, seasoned picketers took the lead in actions outside the stores of Florida’s largest grocer, calling on Publix once again to make good on its neighborly pretense and respect farmworkers in its own supply chain. The sold-out Gainesville screening of "Food Chains" came after a Thanksgiving action led by faith leaders who delivered a whole turkey, tickets to see the film and Fair Food tomatoes to their local Publix manager. Panhandle Fair Food organized a screening, giving the community a chance to join in on the action with this up and coming Fair Food Group. Treasure Coast Fair Food organized up and down the east coast of Florida, securing tickets for "Food Chains" until the theater had to switch venues to accommodate the outpouring of interest. Led by a diverse coalition of students, community leaders and people of faith, they proceeded the much-anticipated screening with a spirited march to Publix. The Bay Area got in on the action as 240 people jam packed San Francisco’s famed Roxie Theater for a showing of "Food Chains." Received with another standing ovation, the CIW was also presented with a 'Key to the City' by author Rebecca Solnit, sending the message that San Francisco stands with the Fair Food Nation. Marching out of the theater to the beat of the Brass Liberation Orchestra, more than one hundred joined for a protest at Foods Co. (whose parent company is Kroger), culminating with a performance of a new track by Fair Food troubadour, Liz Fitzgerald. CIW and AFF were thrilled to be hosted by Santa Ana's El Centro Cultural de Mexico for a very special screening in one of the birthplaces of the Campaign for Fair Food: Irvine, CA, home to Taco Bell headquarters. The packed bilingual screening both celebrated a shared history of community power between Immokalee and Santa Ana and pushed the story forward by leading a delegation to the Wendy's on UC Irvine's campus. As the screening occurred just moments after the non-indictment of officer Darren Wilson, CIW's Lupe Gonzalo requested 4.5 minutes of silence at the completion of the film in honor of Michael Brown and led viewers to a son jarocho-led candlelit vigil afterwards. Following a week of back-to-back presentations at University of Texas-Austin, "Food Chains" made its silver screen debut in the Lone Star state to a sold-out crowd at Austin’s Marchesa Hall & Theater. A week later, Austinites turned out in droves to protest a local Wendy’s, chanting along to the driving cadence of son jarocho music. One weekend wasn’t enough in the nation’s capital, and sold-out shows spurred the West End Cinema to extend the weekend run that was originally planned. DC Fair Food led the charge, as local allies and clergy members joined the CIW for a poignant candlelight vigil outside of Wendy’s, energized by songs of resistance sung by a local a cappella group. After a packed "Food Chains" screening at the well-known documentary theater, SIE Film Center, students and community members grabbed their Wendy's wigs and 'New Day' flags made their way down the busy E. Colfax Avenue to Wendy's doorstep. Denver Fair Food led the way as the entire crowd entered the Wendy's store and demanded to meet with the manager and deliver a letter. 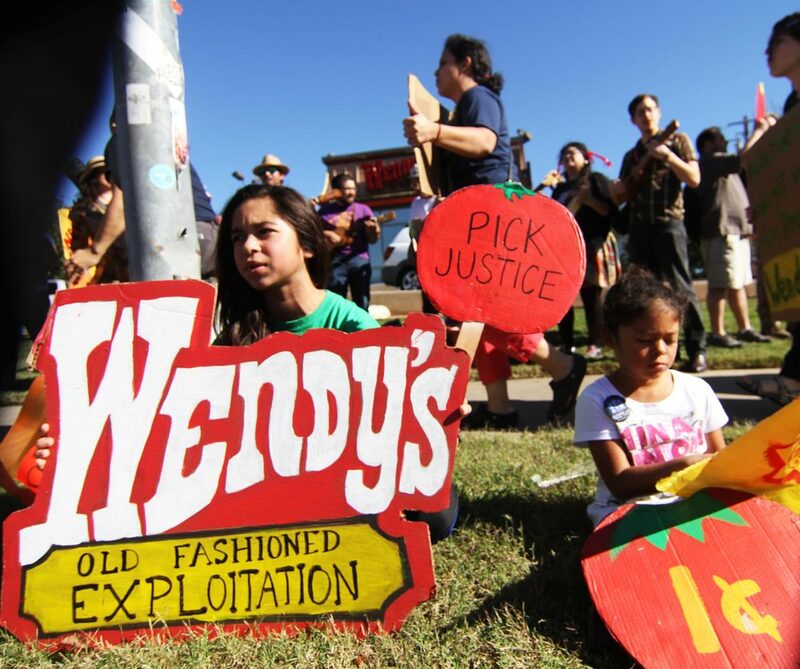 Ohio Fair Food brought farmworker justice to the fore in Wendy’s hometown by kicking off Columbus' Documentary Week with "Food Chains". Columbus residents filled the Gateway Film Center for a special screening and talkback from the CIW's Julia de la Cruz, director Sanjay Rawal and Ohio State SFAer Henry Peller. Students used the film to fuel their ongoing campaign to "Boot the Braids" from their campus; the day after the film screening, dozens braved the rain to knock on the door of their university's administration with renewed resolve. A favorite of the LA screenings was one organized by Food Chain Workers Alliance as part of International Food Workers Week. Following the screening, communities had the chance to connect the struggle for farmworker justice with other local worker-led efforts, including those pioneered by Our Walmart, ROC-LA and Warehouse Workers United. 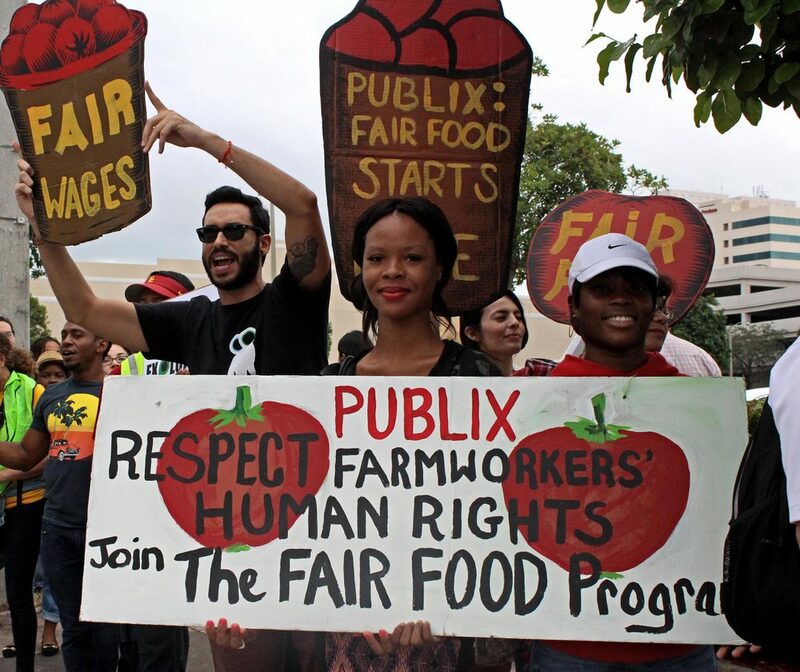 The release of "Food Chains" has brought consciousness of the struggle for farmworker justice to thousands of new people across the country and a wave of spirited action directed at Publix and Wendy’s that won’t let up soon — this is just the beginning! The film will be available for community screenings you can plan together with action starting mid January 2015. ACTION REPORT: Students, people of faith and community allies drop banners in support of Wendy’s Boycott! BREAKING: Longtime CIW General Counsel Steve Hitov to receive national human rights award! BREAKING: Florida Atlantic University Student Government joins UM, UF in unanimously approving resolution to boot Wendy’s from campus! BREAKING: University of Florida student government unanimously votes to Boot the Braids!